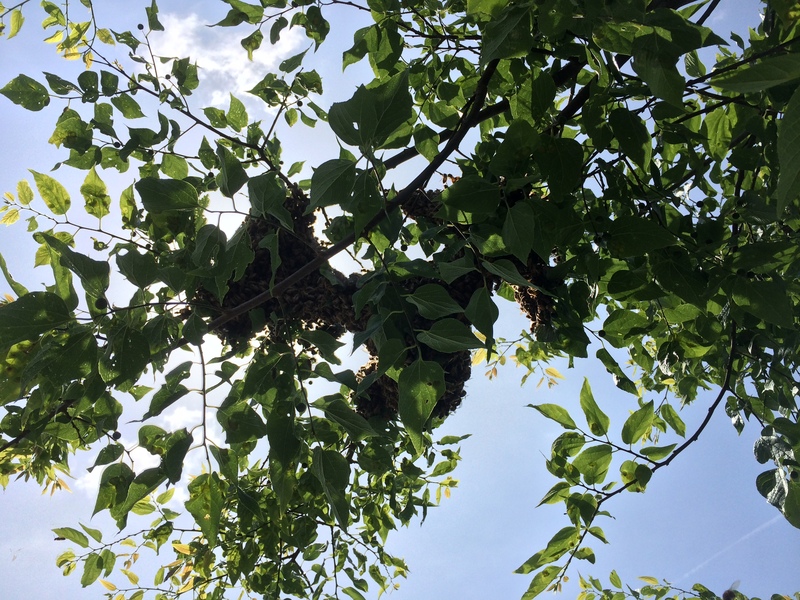 As mentioned in an earlier post, this year marks my third try at keeping bees in our top bar hive…and I am pretty terrible at it. 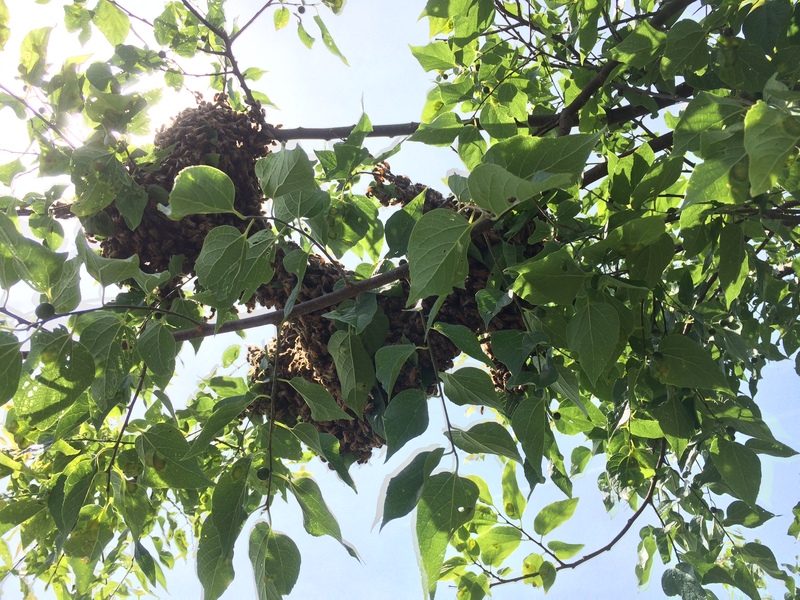 Here is my confession…I have not entered my bee hive since end of April / early May. Once the flow started…as in nectar flow…I quit feeding the bees. I have yet to even remove my feeder that is located within the hive. No doubt that sucker is completely encased in honeycomb by now. So. Hands off. Bees active. It’s all good right? Not likely, else the bees wouldn’t have swarmed last Tuesday. CRAP. I’ve only one answer at the moment. 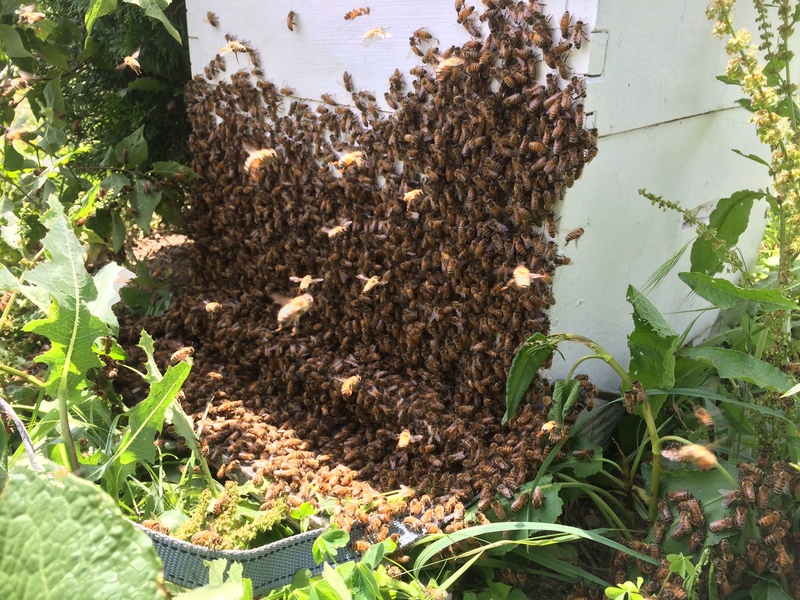 Though I am sad to know I lost a good many bees, I feel fortunate to have witnessed such an amazing event. The sky was full of the flying wonders! And as luck would have it on that day and at that time, I was able to reach out to a neighbor who I knew had two empty hive bodies. 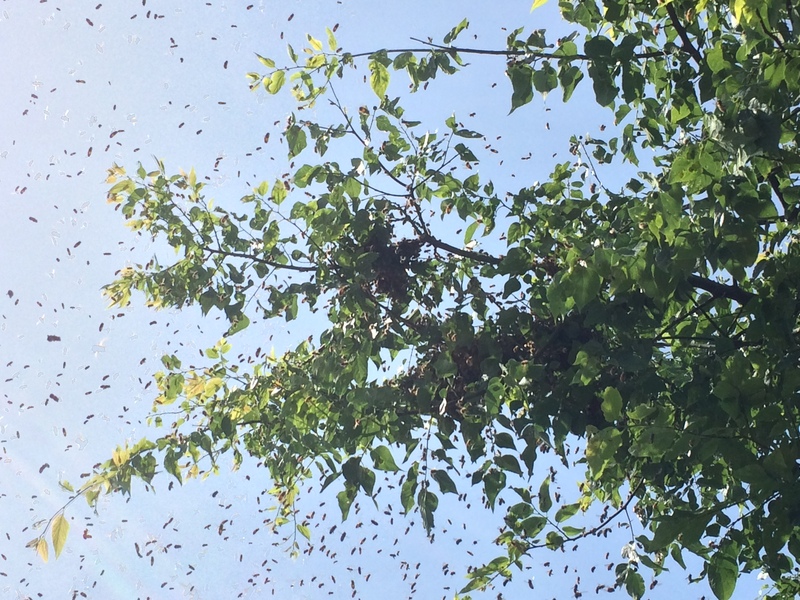 The swarm clustered in a nearby tree and was easily captured. I am happy that the bees will be nearby, though I wish that I could’ve kept them for myself. Regardless, what a sight to have seen! I’ve reached out to the NRVBK association with a plea for a mentor and am awaiting a response. It would be nice to enter the hive with someone who can advise me of what the heck is going on at the time….let’s see what happens with that….stay tuned. Any beekeepers out there with some comments? Good, bad or ugly? I’m a Radford beekeeper who follows exactly the same sort of hands-off approach, and I’ve been very frustrated with the hobby so far. Every year it seems like I need to go purchase another several packages of bees. I had a mentor early on, but she was advocating a lot more messing around than I was prepared to do with my bees. Some days I feel like I’d do just as well to drive down the road throwing money out my window. Please let me know if you figure out how to make this approach work. In the starter class, they talked about beekeepers vs. bee havers, and I thought (apparently incorrectly) that one could be successful as a bee haver, but just not as prolific and productive as bee keepers. I want to be a bee haver, and I’m up to hear more about how this can be done. I think more people would keep bees if they could have them successfully without “keeping” them. Hi, Annie. I would be happy to share any details I might discover. I just don’t want to be one that is constantly invading their home. It works in nature…why not my garden? They have a nice hollow “log” aka top bar hive. My fumbling about just doesn’t seem like a good plan. BUT I don’t want to keep buying packages if I’m only going to lead the poor bees to destruction. I hope a keeper gets in touch with me so I can figure out a compromise. Thanks for your comment! 12 months as Beekeepers. So much to learn! Will follow your progress. Thanks for checking us out. I’d be interested to hear about your experiences, too.